As early as now, Facebook is already gearing up for possibly a surge in membership base come 2010. And first from Facebook’s list of feature improvement is something that we may have never checked at all in our entire Facebook life – the Facebook Help Center. Yes dear readers, there is such a thing. 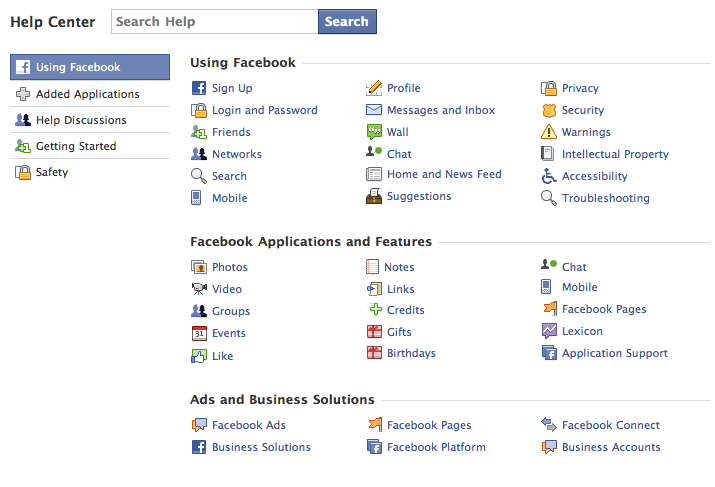 If you’re aware of this Facebook section, let me ask, when was the last time you’ve read it? Or did you read it at all before you begin your Facebook life? If you haven’t check it out before, now is probably the best time to do so, as Facebook recently made some changes to the Help Center to make it more – helpful especially for Facebook newbies. Some of these improvements include, a new search interface, navigation filters on the left side, separate user-to-user support, new privacy and safety pages, separate user-to-user support navigation and unique web addresses or URLs. The Facebook Help Center is loaded with useful information about making your lives better, easier and more fun as you become part of the Facebook community. So, there’ s no harm in actually visiting it from time to time. What? You don’t know how to access it? Just hover your mouse cursor on the Settings tab and select “Help” from the pull-down options. Better yet, just click on this link to visit the Facebook Help Center.